Bart Bettiga, Executive Director of the National Tile Contractors Association (NTCA), kicks off the series with this :45-minute video where he shares what he considers to be the three key components of a successful tile project and the importance of qualified labor in the tile industry. Without any of these three components, you don't have a successful project. Qualified Labor includes certification and training, which is why tile installation projects last for a lifetime. Next in the series is our very own Scott Carothers, Director of Certification and Training for the Ceramic Tile Education Foundation (CTEF), who in the one-minute video below explains how qualified labor is a craft and an art. According to Scott, setting ceramic tile professionally has two aspects: as a craft and as art. Tile installation is a craft (and a trade) where installers have received training on proper tile installation according to the accepted standards and methods throughout the tile industry in the United States. Beyond the craft, there's artistic value to the installation. When Qualified Labor incorporates its creative juices into a project along with the installation expertise derived from their knowledge and usage of the TCNA Handbook and the ANSI Specifications, all involved enjoy a win-win result. These artistic masterpieces not only meet and exceed their client’s expectations, but these projects provide excellent advertising to those contemplating an upcoming tile installation. It's critical that we get that information into their hands so they can use that knowledge and equate it to a quality installation that will stand the test of time. Mike Corona CTI #923 of Corona Marble and Tile shares in this 1:06 minute video that continuing to learn is a key component of qualified labor. Mike is a second-generation tile installer working in the family business, Corona Marble and Tile that his father started. He got into the trade because he saw an opportunity and a need for skilled labor. However, you don't become a tile installer or a business owner overnight. It takes time, enthusiasm, pride, reliability, respectfulness, a willingness to learn, and dedication. No two jobs are the same; each one has its own unique nuances. As a qualified installer, you need to be able to communicate how to deal with those nuances and qualify yourself to not only meet but exceed expectations. Being qualified will exponentially increase your value and you will have endless opportunities. In this next 1:05 minute video, Nyle Wadford, NTCA Five-Star Contractor of Neuse Tile Service, Inc., explains that the benefit of hiring qualified labor means you are getting a professional installer, working for a professional company, resulting in professional installations and a happy customer. Neuse Tile Service is a proud employer of Certified Tile Installers. As Nyle explains, when he hands a project like this to his installers, he has already made sure that they are well trained and knowledgeable in tile installation methods and standards. His installers are dedicated to the craft - as Scott described - and produce professional works (of art) each day that delight customers. From a practical perspective, qualified labor saves a lot of money on the backend. Victor Fox & John Wirtz of Wirtz Quality Installations explain in this next 1:14-minute video that Qualified Labor means a quality product and a happy customer! Wirtz Qualify Installations has been setting tile throughout San Diego since 1972. They rely on Qualified Labor to consistently provide a quality product to customers who expect as much. The only way to produce that level of quality is with professional tile installers who know what they're doing and how to conduct themselves on the job. Roger Leasure from Northern California Tile and Stone describes in the 1:08-minute video below how qualified labor delivers advantages to customers in terms of a professional, fast, and safe project, as well as a high quality of life and benefits for the craftsman and all areas of the business operation. Northern California Tile and Stone is well known for doing large malls, casinos and resorts. In addition to being a Natural Stone Institute member and a NTCA Five-Star Contractor, the company is a proud employer of CTEF Certified Tile Installers. Roger Leasure explains that bids his company submits are never really low. Rather, they are in the high range and that's because he employs skilled craftsmen, who receive full medical, dental and retirement benefits. When his team shows up, it gets the job done fast, safe and with perfection. It is like art: a combination of technical ability and creativity. Erin Albrecht and Christine Kotara of J&R Tile in San Antonio, Texas share their advice in this 1:08 minute video for building a winning team with Qualified Labor. J&R has been in business since 1984 and tries to get better every day by educating employees and staff. What's your Reaction to Why Qualified Labor from WhyTile? 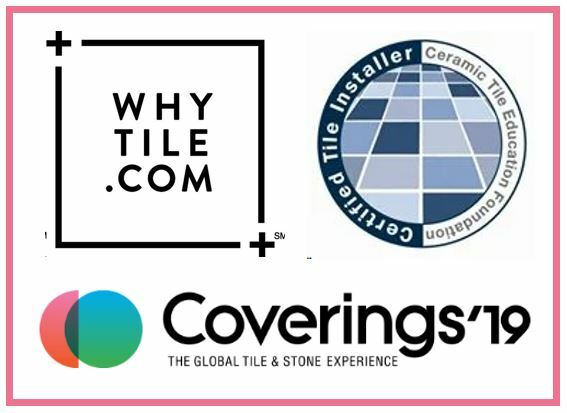 Let us know here in the comments or come by and visit with CTEF at Coverings where we're looking forward to promoting Qualified Labor with the NTCA and WhyTile at Coverings.